Keeping up with your vehicle’s maintenance schedule is one of the most important ways to prevent expensive damage to any number of important systems. Time and money spent on car maintenance is an investment for avoiding many auto repairs down the road. Not sure when to do these things? Every vehicle’s manufacturer has a schedule for recommended maintenance. Getting your oil changed means replacing the fluid that keeps your engine’s metal parts moving and preventing it from seizing up. The oil is essentially the lifeblood of the engine, and neglecting it can result in costly repairs. Oil changes should be performed per your mechanic’s recommendation or as outlined in your vehicle’s maintenance schedule. You can also check your engine’s oil when the engine is cool, to make sure it is clean and filled to the proper level. 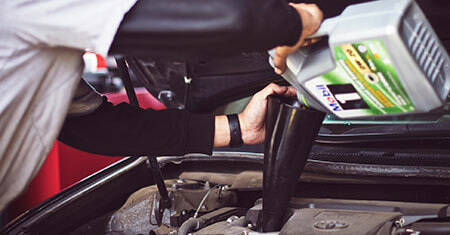 At an oil change, your mechanic will bleed the oil from the system and replace it as well as the oil filter. Keep your engine healthy by having this done regularly. A spark plug is the type of part that wears over time, but it does a very necessary job. In order to start your car and successfully convert fuel to power, your spark plugs need to fire. Worn or bad spark plugs can result in difficulty starting your car, slow acceleration, or poorer fuel economy than you’re used to getting. Having your mechanic check and replace your spark plugs can help prevent damage to other systems in your car. There are two types of air filters in your vehicle that you should replace regularly, the cabin air filter affects the air you breathe as you operate your vehicle. This is important to replace to keep the nasty stuff in the air outside of your vehicle from getting into your car and your lungs. It’s recommended to replace this filter each year. The other filter that’s important to replace is the engine air filter. As the engine uses air from outside of your vehicle in the combustion process, this prevents contaminates from entering the system. It’s important to change this on schedule for your engine’s overall health and performance. Over time your tires experience wear, and they experience it differently from the front of the vehicle to the back. This is why it’s important to rotate your tires, meaning switching them from left to right or front to back. You can get a better life out of your tires by rotating them on schedule. It’s also a good time that we might notice uneven wear which might point to an alignment issue. We’ll also check the wear of the brakes while the wheels are off. A tire rotation is a relatively quick job, and can be done alongside other maintenance services. Don’t neglect regular maintenance if it can keep you from big repairs in the future. Whether you need one of these things done or all of them, stop on over to Big Jim’s. We’ll help you understand what your vehicle needs and why, and we’ll get it back in tip-top shape as if it were our own.